With Microsoft new Universal Windows Apps tools, it's easy to share code between Windows 8.1 and Windows Phone 8.1 XAML apps. Now, developers can deliver beautiful end user experiences on all new Windows devices, with radically less cost and development effort. This means they can painlessly extend their conventional PC development work to fast-growing tablet and smartphone markets. In Universal Windows Apps with XAML and C# Unleashed, the world's #1 XAML expert shows Windows developers how to do all this, and more. 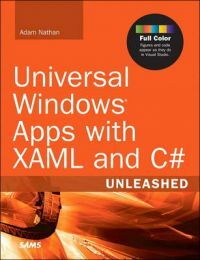 Just as he did in previous best-sellers like Windows Presentation Foundation Unleashed and Windows 8 Apps with XAML and C# Unleashed, Adam Nathan delivers comprehensive coverage, accessible explanations, and plenty of outstanding full-color code samples. Drawing on his unsurpassed experience with modern Windows mobile development, Nathan shows how to build the apps you want to build -- not just the apps Microsoft's SDK makes easy. You'll learn how to unify your Visual Studio code bases for assets ranging from user controls to styles, graphics, and animation. You'll even learn how to unify your monetization, delivering apps and in-app purchases on both Windows and Windows Phone through a single purchase.